Well, I finally decided to crack open this amazing bottle of wine and see if I enjoy it as much as I did the first time I tried it. 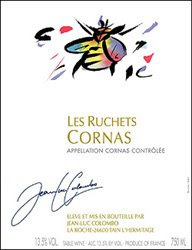 The Les Ruchets Cornas from Jean-Luc Colombo is made from 100% Syrah. These Syrah vines are on average 90+ years old and are planted on the steep slopes of the right bank of the Rhone. The grapes are de-stemmed and fermented in stainless steel tanks with 4 days of pre-maceration, 7 days of fermentation with a maximum temperature of 82.4°F and 3 weeks of post-maceration. The wine is then aged for 18 months, 70% in new oak and 30% in one-year-old oak barrels. It is unfiltered.